The first Yoonmirae hip-hop album was so precious to me, that I remember being heartbroken when someone stole it from me (yes, that album was that hot). It has remained a favorite hip-hop album 16 years later, and fans have waited ever so patiently for a part 2. And on July 5th, 2018, we will finally have it. Yoonmirae’s “Gemini 2” track list was released on July 3rd by Feel Ghood Music, and it was announced the title song, “YOU & ME,” will feature fellow FGM artist, Junoflo. 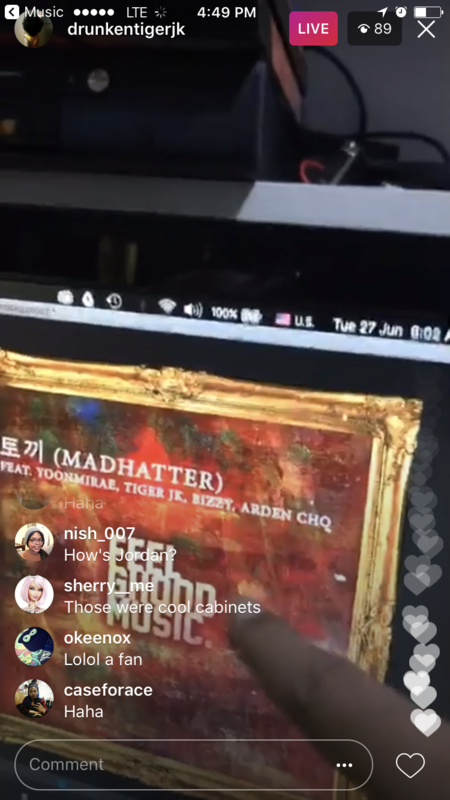 While the feature with Tiger JK and song, “Cookie (assumingely about Jordan)” are of interest, the first song on the album is definitely eye-catching. The album is scheduled to drop July 5th, 6PM KST. “Yet” is a visual and lyrical journey through Tiger JK’s career obstacles. While JK reminisces in a room filled with MFBTY memorabilia, his first verse takes us back to his early artist days. Long time fans can remember that although Korean hip-hop was gaining popularity during the 90s, it was still considered unprofitable and genre most mainstream labels were afraid to touch. Tiger JK was considered an outcast, for his Korean-American heritage and for the music he represented even through DT’s most successful days. However, the “Yet” hook is an homage to the millions of fans that Drunken Tiger have gained through the era despite those obstacles. As we’re simultaneously taken through Tiger JK’s transformation and legendary performances visually, we’re reminded lyrically of “fans wearing Drunken hats (2004-2012),” and the “one shot” call is a nostalgic phrase that has prevailed through Drunken Tiger songs since the beginning. It’s the second verse where we’re taken into JK’s deepest struggle. We’re told a story of JK discovering trusted individuals (inferred in his lyrics as Jungle Entertainment), stealing from and betraying him. The lyrics describe these individuals misusing his, Yoonmirae’s, and his son, ‘Jordan’s “dojang” (a Korean stamp used to officiate documents) to forge documents and misuse funds for personal gain. To add insult to injury, JK’s father’s cancer diagnosis is also mentioned having happened at the same time. We’re taken through JK’s dark frustration, as he alludes to trying to raise his son, take care of his father, and dealing with a massive financial and emotional betrayal. However, we’re given a sense of promise and sense of invigoration towards the end, and he calls to fans who have stayed with him once again. Though only a bit over 3-minutes long, the song leaves numerous contextual questions: What did JK particularly endure? In a recent podcast episode with Jung YoungJin and Choi Wook, JK answered numerous questions related to his career, many relating to the “Yet” single. The first verse: When he first debuted with his solo album, Tiger JK was met with much backlash by the industry for bringing in hip-hop culture in a time where its rebellious elements were still considered taboo. JK revealed that though his solo sold 150,000 copies, a feat that defied the numerous bans on its songs, it was considered unsuccessful in comparison to other artists of the time. Censorship carried over into when Drunken Tiger the group debuted in 1998, and while they started to receive recognition in the underground scene, the label still saw Drunken Tiger as an unprofitable liability. Much of Drunken Tiger’s earlier work relied on themselves to book shows, set up studio time, and direct their own music videos. Long time fans can remember the MVs being low budget, being primarily filmed on streets, subways, and in their own clothing. However, Drunken Tiger soon proved to be an anomaly success, having prevailed locally and also within the international community. The second verse: “Yet’s” second verse is given context midway through the interview, where JK discusses having had suspicions of his former management hiding money, despite him and Yoonmirae being at peak points of their career. While initially overlooking this as much of his management were familiar with JK for nearly a decade, the amount of work put in did not add up to what was being earned. After doing numerous advertisements with big name artists, how or why Jungle could be in deficit did not add up. During a late night where JK returned to the office, files were discovered revealing how the management were forging documents and embezzling nearly 5 million USD in album sales and appearance fees. Plans were in place to secretly sell off the company while simultaneously dumping JK and Yoonmirae. The couple have alluded to Jungle’s mishandlings for years, but to fully disclose in this matter has not been easy. JK, Yoonmirae, and Bizzy left the label to establish Feel Ghood Music. However, the legal ordeal between Jungle lasted for years. To add insult to injury, JK’s father received cancer treatment that was initially misdiagnosed, and later inadequately treated, contributing to his death in 2014. When asked if JK is able to legally fight for the funds, he replied, “By the time I was able to start litigations, the label was sold off to a larger more powerful corporation,” implying it would a feat to fight legally. Although the years have been tumultuous, JK found solace that his music wasn’t a failure. He made million dollar music, but just millions that he never saw. The podcast covers an extensive amount more that this blog space can cover (i.e. JK’s TaeKwonDo instructor days, and why he donated thousands of savings to Sewol Ferry tragedy). Set aside an hour for an interesting listen. What are your thoughts on “Yet” and the final Drunken Tiger album? If you say I’ve aged, I’ve aged. I breathed the Boom Bap, I danced the Boom Bap. It’s no secret Drunken Tiger JK has been planning to retire the Drunken Tiger name for awhile, but fans were fortunate that the retirement date was delayed due to other factors. However, our relaxation period is coming to a close. On April 4th, 2018, Tiger JK alongside MFBTY announced he was releasing “the last Drunken Tiger album” most definitely this year, with a single now scheduled for this Friday, April 13th, 6PM KST. According to JK, the single titled “Yet,” is representative of the classic Drunken Tiger feel, but adds a modern spin for new generation fans. The full album still has an unofficial release date, but fans have “Yet” and also a Yoonmirae (hip-hop!) single coming out next week to hold them over. Peep the preview below and let us know what you think. Summer 2012 – KPOP NIGHT OUT in Singapore got a dose of YoonMiRae, Tiger JK, and Bizzy during the pre-stages of MFBTY during a humid Asia night. Fans welcomed the trio from their first steps into the country until their take off at the airport, leaving fans waiting eagerly for their return. Despite a very warm reception, the trio has not done an Asia show (outside of Korea) since then. But thanks to Concrete & Grass MUSIC FESTIVAL, patient fans can now relax. September 17th marks the a huge moment for MFBTY, where they will be performing amongst a mega line up of international stars. Other stars scheduled to perform include Miyavi, DJ Premiere, ASAP FERG, Zuriaake, and Re-TROS. MFBTY will be coming with surprise rappers plus their own band, giving the international stage an extremely rare performance. If you’re in Shanghai, then we suggest fans jump on this show. Don’t make yourself wait another 4 years for another chance. For immediate updates, follow Concrete & Grass on Twitter, Facebook, and Instagram: @THECONCRETEKIDS. We thought we had a load of work cut out for us already, including releasing this package of exclusive images (see 1, 2, 3, 4) to promote Bizzy’s grand return. We underestimated our Bizzy B, however, when Feel Ghood Music announced that B would be watching the premiere of his video on Naver V alongside his fans. Our generally quiet boy had a 180 tonight, being very vocal about how much this release meant to him. Remaining true to his honest nature, he did admit he was nervous being it has been so long he’d release something on his own. This is also one of the few times he’s hosted a Naver V session alone, and he wasn’t sure what was it fans wanted to see. He made us proud when he trusted his gut, doing a mini performance alongside his MV viewing, and then giving us a freestyle after. Bizzy’s official stage debut of “All I Need” is tomorrow on M Countdown, but hey, real fans know his debut performance just happened 2 hours ago. Check Bizzy’s full MV below, though you might wanna’ preface it with his Naver broadcast for optimal enjoyment.